Call 0161 233 6360 to fulfill your ambitions. Although the World Cup seems to be a bit more open this time round, it seems year on year the In-House legal sector is continuing to strengthen its employer proposition in a bid to bring the best possible legal talent onboard. In-House lawyers employed in the private sector enjoy the most comprehensive benefits package in the legal profession, according to research undertaken by legal sector recruitment specialist Douglas Scott. In-House Private Sector employers scored 634 on Douglas Scott’s Legal Sector Benefits Index, on the flip side of the coin Sole Practitioners, who account for approximately 40% of all employers in private practice, managed just 141. It’s a similar picture across the legal sector, the haves and the have nots, big budgets underpinning the best salaries and benefits packages, mid-sized looking for an edge through creativity and high street firms doing their best stretch resources whilst maintaining a happy workforce. It’s well publicised that high street law firms are in a corner, in those circumstances, as Bear Grylls would advise, you use your environment. Top 2 in private practice for free or subsidised parking and free legal services. It’s a similar thing with Sole Practitioners; flexi-time, parking, company car and, under-used in the legal sector, employee share schemes are all stand out elements. As well as being overall champions In-House Private Sector lawyers top ranked in 5 benefits categories: Free or subsidised parking, EMI or employee share schemes, company car, pension and laptop/mobile. In-House Public Sector lawyers and In House Not for Profit lawyers shared a number of similarities but also some striking differences. At 71% they were equal top ranked for above statutory minimum holidays and were a close first and second for providing a sick pay scheme above and beyond SSP. Not for Profit ranked top with 43% for offering an enhanced maternity / paternity package and Public Sector was second with 35%. Both were in the bottom two for providing subsidised or free legal services. 57% of lawyers working in the Not for Profit sector benefited from private medical compared to 8% in the Public Sector. 34% of lawyers working in the Public Sector park their cars for free or on a subsidised basis compared to absolutely zero working in Not for Profit. A top ranked 68% of lawyers working in the Public Sector benefited from flexi-time compared to second ranked 36% of Not for Profit. 5th ranked overall, In-House lawyers working in Financial or Insurance institutions top ranked for bonus and occupied first or second place for critical illness cover and life assurance. International law firms were ranked third place in the benefits index with 593. A solid all-rounder International law firms only overall top ranked in one benefit category, gym membership which at 31% was shared with Costs Lawyers. The strength instead came when going toe to toe with private practice, ranking first or second in 9 out of a possible 16 categories of benefit. You could throw a blanket over the Top 200 UK law firms in most categories. 1-50 came overall second with 614, 101-200 ranked fourth with 587 and 51-100 sixth with 570. Look no further than the top 200 if a fully comprehensive benefits package is on your shopping list. 25 points separated In-House Not for Profit and Public Sector and whilst demonstrating many similarities in benefits packages there were also some interesting disparities. Not for Profit rank first overall for Sick Pay, Public Sector second. It is a similar story with Enhanced Maternity and Paternity, you will not get a better deal throughout legal than the one offered by Not for Profit, second comes Public Sector. 57% in Not for Profit have Private Medical, just 8% in Public Sector. 34% of In-House Lawyers employed in the Public Sector however enjoy free or subsidised parking, according to our research no In-House Lawyers employed in Not for Profit have the benefit. Public Sector lawyers top rank in the legal sector for flexi-time with 68% enjoying the benefit, Not for Profit are second overall in legal but at 36% it is nearly half as many. You could get the impression that ABS legal services providers are looking for cost neutral ways of improving their benefits packages. Ranked 10th overall, they mid-rank for many of the benefits package components, but second for free or subsidised parking and third for free or subsidised legal services. Expect to make sacrifices if you move to Boutique Commercial. Ranked in the bottom 2 in the legal sector for flexi-time, the 44-hour weeks will also be more or less the same as the Top 200 and 2 more than in full service regional networked private practice. It is perhaps not fair to pitch David against Goliath in this instance and packages do compare favourably when viewed in the context of the average benefits package in the legal sector as whole. It is a different story in Boutique Private Client, your Family Law and maybe Criminal specialists. 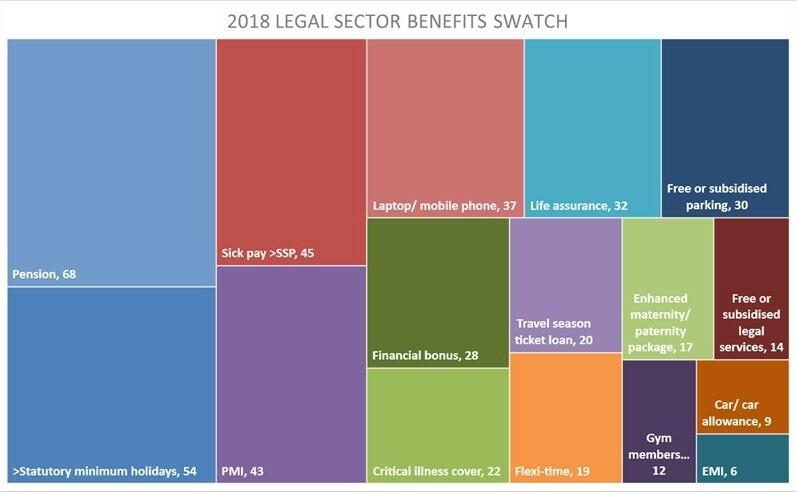 Ranked 13th in the legal sector, each benefit package component ranks below average in participation, individually free parking and financial bonus are the likely plus points. PI Specialists have been under the cosh from reformers for over a decade and could be forgiven for only offering the most basic of benefits packages. However, they know their people and have sprinkled the fairy dust where it will have most impact. Discounting In-House the flexi-time benefit ranks second overall amongst private practice employers, free or subsidised parking is third and bonus is top ranked outside of In-House and the Top 200. If you are looking to compete then your stand out benefits would be bonus, flexi-time and free parking. Year on year our research demonstrates that Residential Conveyancers are amongst the least transient of legal professionals; the demand is always there but most Residential Conveyancers just like it where they are. Bonus, free or subsidised parking and pension are the stand out elements in the benefits package with the latter ranking 4th overall amongst private practice employers. Placed in the context of firms that are competing for their talent, Residential Conveyancing Specialists may consider improving their packages. Firms ranked 101-200 in the UK 200 and multi-branch networked private practice both offer significantly better packages including sick pay, critical illness, private medical, life assurance, legal services, gym, maternity/paternity and season ticket loans. A bit of a surprise to see Costs Lawyers ranked second bottom for benefits? Well, top ranked overall for gym membership and in private practice for flexi-time means Costs Lawyers are likely going to be the fittest legal professionals out there. There’s a whole lot more we have uncovered on our deep dive into legal sector benefits data. If you are interested in learning and understanding more then please give our marketing team a call on 0161 233 6360 or contact marketing@douglas-scott.co.uk and we will gladly put some visuals together that will help you compare and contrast the employer proposition across legal sector employers. Results are now in – see where you fit in the legal landscape. Get your job search started by signing up and uploading your CV. Rest assured we will never forward on your CV without your approval. Sign up for Touchpoint, our monthly newsletter covering what’s happening in the legal sector plus the latest trends, case studies and not to be missed interviews. Copyright © 2019 Douglas Scott Legal Recruitment.